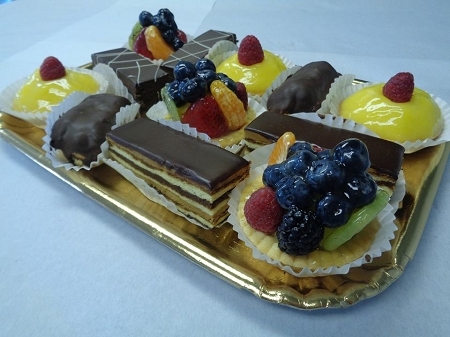 14"X10" Gold board tray with clear dome lid filled with 1 dozen pastries of your choice. Pastries are made fresh daily by Taste Budd's Pastry Chefs. The clear dome lid keeps them fresh for transport and is stackable. Choices are Lemon Tarts, Pecan Tarts, Fresh Berry Tarts, Chocolate Eclairs, Coffee Eclairs, Chocolate Madness Cakes, and Opera Torte.